Don’s hasn’t stayed in business just because of a great location for walk-ins. They haven’t benefited from being on a busy highway or just off a well-traveled expressway. Don’s has thrived by delivering good food with friendly service. Don’s is a destination. I encourage you to put the address into your GPS system before you set out for this Pittsburgh treasure. I recently showed up at Don’s for breakfast, and I was greeted with a friendly hello. The six booths to my left were all occupied, and the first six of the 12 stools in front of the counter to my right were full. I walked to a counter stool in the back of the restaurant near the grill. As I made my way to my stool, I saw the large “Let’s Go Pittsburgh” banner on the back wall. Don’s has a friendly feel. As a waitress approached me with a menu, another waitress near the front door greeted a customer with, “Hey Joe, what do you know?” Don himself was focused on the eggs, omelettes, pancakes and burgers he was preparing. After a minute of examining the menu, I placed my order: coffee, Philly and Cheese omelette with wheat toast. In the few minutes I spent waiting for my food, I heard a guy next to me order a Wet Judy. “The best sandwich in Pittsburgh,” he immediately replied. While I never take the term “the best” seriously, I heard so many people order enough Wet Judy sandwiches for me to promise myself that I’ll have to come back and check out what seems to be a favorite at Don’s. A minute later I was enjoying my coffee. I looked at the grill and noticed that an omelette was being beautifully folded and a half dozen other orders being prepared, but to tell you the truth, I was only interested in the omelette. If I were cooking, I would need a half dozen different timers to keep everything straight or a few microwave ovens. I didn’t see any timers or microwaves at Don’s; I only saw Don’s back as he stayed focused on his mission. 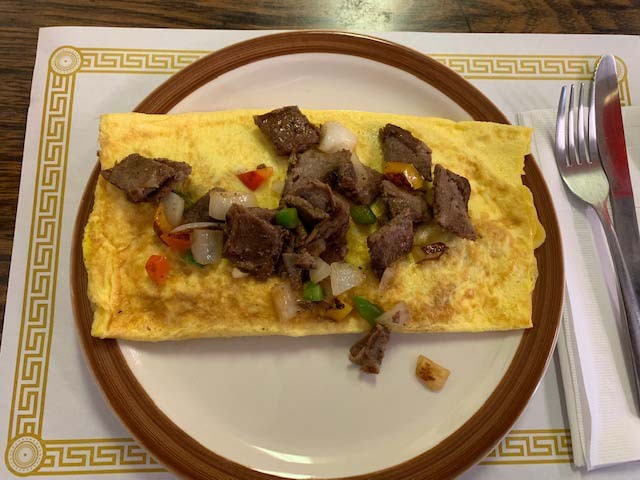 My three-egg omelette was served filled with steak, cheese, onion, and peppers before I had a chance to finish my first cup of coffee. One taste and I, once again, realized why this place stays busy. Fifty minutes after entering the Eckert Street restaurant, I was ready to go. It had been a good experience. Great food, great service, friendly atmosphere. I couldn’t ask for anything more. I don’t know what Don looks like; he never turned away from the grill. But I do know that he serves food that does not disappoint. Don’s is open Tuesday thru Friday from 6:30 a.m. to 1:00 p.m. On Saturday, they close at noon. Cash only. When you arrive at this eatery for the first time, you may have the feeling that you’ve seen this place before. You may have; Don has allowed Hollywood to use this location for several feature films including Nick Nolte’s Warrior and The Next Three Days starring Russell Crowe. And in the zombie movie 12/24, Don even has a part.